For other uses, see Monument (disambiguation). 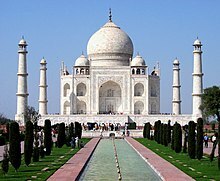 The Taj Mahal, commissioned by the Muslim Mughal Emperor Shah Jahan, as a mausoleum for his wife, Arjumand Banu Begum. A monument is a statue, building, or something else made to remember a person or important event. They are often designed as artistic objects to improve the look of a city or place. Nelson's Column in Trafalgar Square, London, commemorates Admiral Horatio Nelson. The "Monument to the Discoveries" in Lisbon, Portugal, commemorating famous Portuguese explorers.